In coverage of economic and market news it is difficult to unravel the negative tone that is intertwined in stories about unemployment, government debt, European currency union struggles, etc. It seems to me that the heart of the matter is the lack of economic growth and the poor prospects for it happening anytime soon. A regulatory framework that increasingly stifles investment and innovation. Between 1991 and 2000, 18 percent of venture-capital backed companies went public within five years of receiving funding. From 2001 to 2010 that number stands at 1 percent. Increasingly complex regulations around corporate finance and disclosure have played a significant role in stifling investment in new companies and ideas. Other examples abound, such as the EPA’s efforts to stifle coal-powered electricity generation and the likely ramifications for shortages in electricity generation capacity in the not-too-distant future. A loose money/low interest rate monetary policy that has eroded the value of the dollar and been a disincentive to save and invest. For a decade the U.S. has followed a near zero interest rate monetary policy, whereby the incentive shifts from saving and investing to plowing dollars into hard assets, whether gold, real estate, or whatever. Economic growth is wealth creation, and it comes from 1) working, 2) saving, and 3) investing. We lack all three, and erosion in the pillars of free enterprise impede healing of fractured markets and subsequent economic growth. Insofar as work/production is reflected in unemployment, the picture is bleak. The recent tick downward in the U.S. unemployment rate below 9 percent came from fewer people seeking work, not from creation of more net jobs. In addition, should it be a surprise to have high unemployment when we pay people to be semi-permanently unemployed? Unemployed workers are now eligible for a maximum 99 weeks of federal and state benefits. Why not increase it to 104 weeks, an even two years? The United States is on track to record a savings rate for 2011 below 1 percent of income, which would be the lowest since the depths of the Great Depression, when the rate turned negative. Political scolds chastise us for our spendthrift ways, but should it be any surprise when interest rates are at near zero and a weakened dollar buys fewer necessities from one year to the next? People respond to what’s in front of them, and the incentive to put off consumption today for an economic return tomorrow is severely lacking. In the same vein, the incentive to invest in innovation and new enterprises is also diminished. While commodity price levels hover at all-time highs venture capital investing, new manufacturing investment, and the number of newly created businesses all lag. The incentive for putting dollars in hard assets exceeds that to put money in new ventures and innovations. Lest you think that investment in start-up companies is of interest only to entrepreneurs, keep in mind various studies that depict the importance of start-ups in employment and job creation. 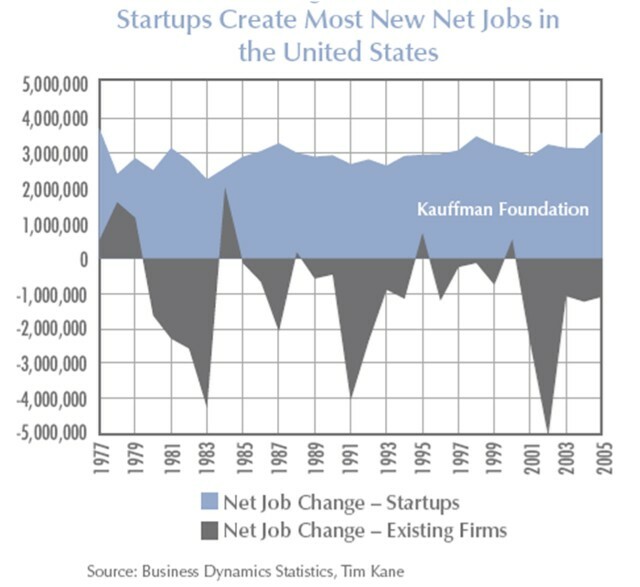 For example, the Kauffman Foundation in the last year published a study (The Importance of Startups in Job Creation and Job Destruction) using a new dataset to depict the importance of new companies in job creation. The study shows that without startups, there would be no net job growth in the United States. This fact is true on average, but also is true for all but seven years for which the United States has data going back to 1977. Lagging start-up activity is bad for innovation and competitiveness, but it is also bad for employment. I believe many in the U.S. now better understand the false hope offered by monetary illusion and meddling politicians. 74 percent of respondents now tell pollsters they believe the country is on the wrong track. For the average person to believe that the country is on the right track, I think they need to believe that the country is on a solid foundation of traditional financial stability that will lead to a prosperous future. They want new jobs, earned income, sustained value in their currency, and the dynamism that only free enterprise can deliver. The central economic authorities have tried, but their efforts only stifle the natural healing mechanisms of markets unhindered by regulations, political and regulatory uncertainty, and distorted incentives. Free enterprise will assert the real price of risk, allocate capital in proportion to promise, allow individuals to correctly chart the course of their own careers and lives, and ultimately restore economic growth. Let freedom ring.